Singapore, 28 Apr 2015 – With five months to one of Asia’s most anticipated sporting and entertainment extravaganza, the three-day Zone 4 Walkabout ticket is already sold out. Fans can now opt for the limited single-day Zone 4 Walkabout tickets, which go on sale from 1 May, 0900hrs (Singapore time). A maximum of four tickets are allowed per person for the purchase of Friday Zone 4 Walkabout tickets (S$68nett), Saturday Zone 4 Walkabout tickets (S$158nett) and Sunday Zone 4 Walkabout tickets (S$188nett). The single-day tickets are expected to sell-out fast, as they provide fans great value-for-money. Zone 4 Walkabout tickets enable fans to cheer on their favourite Formula One drivers up-close from strategically located bleachers along the track. The same ticket also give patrons access to the Padang Stage concert for the day – Pharrell Williams on Friday (18 September), Maroon 5 on Saturday (19 September) and a yet to be announced Sunday act (20 September). Single-day Zone 4 Walkabout tickets to the 2015 FORMULA 1 SINGAPORE AIRLINES SINGAPORE GRAND PRIX can be purchased at www.singaporegp.sg, via the ticketing hotline +65 6738 6738 as well as SISTIC outlets* in Singapore. 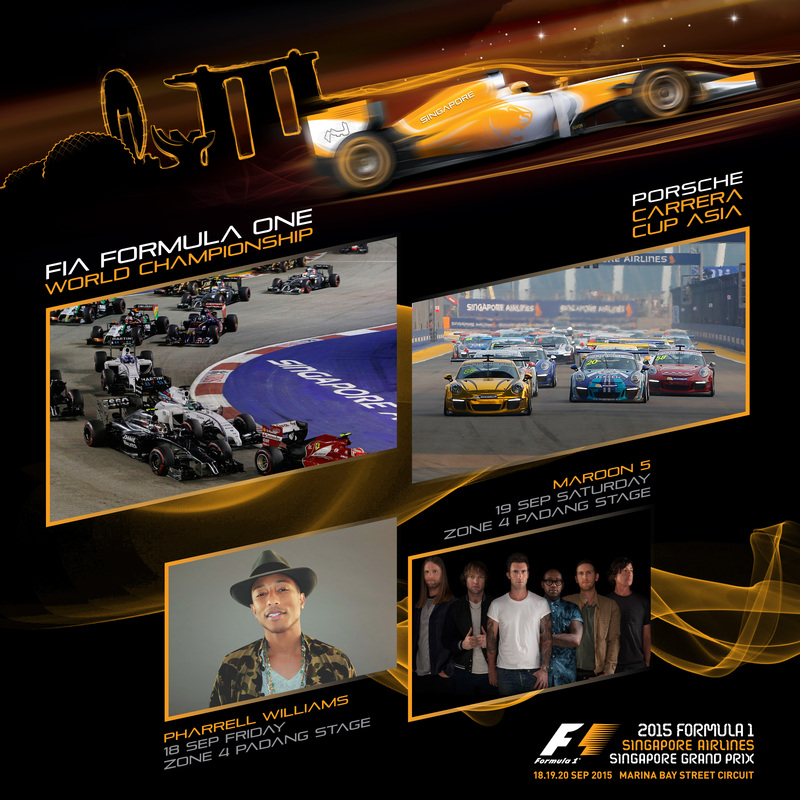 Fans who purchase a pair of tickets to the 2015 FORMULA 1 SINGAPORE AIRLINES SINGAPORE GRAND PRIX stand a chance to win a pair of exclusive passes to meet and greet Maroon 5, Pharrell Williams or Spandau Ballet. To participate, ticketholders can register at www.singaporegp.sg by 30 June 2015, 2359hrs (Singapore time). Singapore has successfully hosted the only night race in Grand Prix history and Asia’s only street race on the Formula One™ calendar at the Marina Bay Street Circuit in downtown Singapore since the inaugural race in 2008. For more information, visit www.singaporegp.sg.